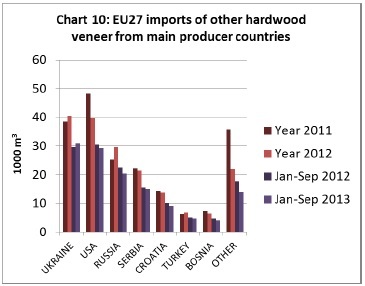 EU imports of hardwood veneer have been declining this year. Imports of tropical hardwood veneer in the first nine months of 2013 were 180,800 cu.m, 10.2% less than the same period in 2012. During the period, imports from Gabon fell 13% to 89,100 cu.m. Imports from Ivory Coast were down 9.5% at 42,700 cu.m. These losses were only partly offset by a rise in imports from Cameroon, up 7.3% at 21,500 cu.m. 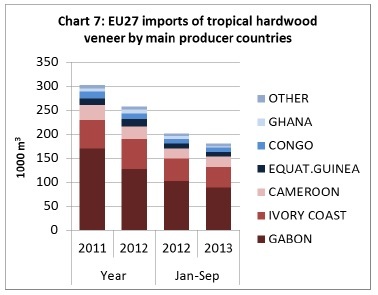 In the first nine months of 2013, imports of tropical hardwood veneer into France declined 14.9% to 75,100 cu.m. Imports into Spain fell 12.1% to 24,100 cu.m. However, after a very weak year in 2012, there was a 17.7% rise in imports by Italy in the first nine months of 2013 to 41,100 cu.m. 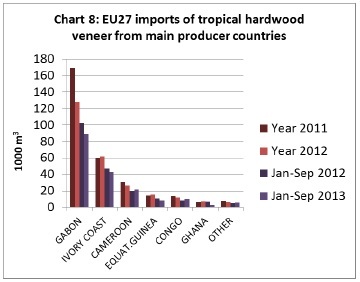 The decline in EU imports of tropical hardwood veneer is partly due to weak demand in end-use sectors for decorative sliced products. Sales to the European door and furniture manufacturers have been weak all year. There has also been only slow demand from large interiors projects, such as hotel, shop and bank refurbishment. While sales of sliced veneers to board manufacturers and higher value speciality sectors, such as automobile and yacht manufacturing have been more stable, these have been insufficient to offset the decline in the larger industrial sectors. In fact rising sales to veneered board manufacturers may be partly at the expense of direct sales of veneers to joiners. Prices for sliced veneer are coming under intense pressure in the European market. The market situation is little better for rotary tropical hardwood veneers used for plywood and flooring manufacturing in Europe. Market conditions in the European engineered wood flooring sector remain weak and there is a continuing trend to substitute tropical woods for alternative materials. There is also limited demand for veneers in the European okoume plywood manufacturing sector now that capacity is much reduced, particularly following the closure of France-based producer Plysorol in 2012. EU imports of temperate hardwood veneer in the first nine months of 2013 were 127,900 cu.m, 5.9% less than the same period in 2012. 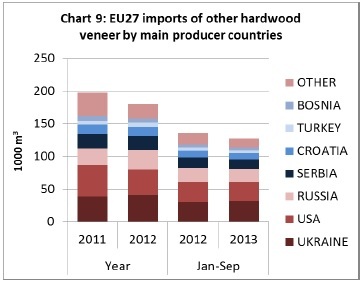 Due to recent inward investment, Ukraine is becoming a more important external supplier of hardwood veneer to the EU. According to UNECE Timber Committee data, veneer production in the Ukraine has been rising in recent years and the country is exporting a wide range of sliced, rotary and reconstituted (fine-line) veneers into the EU. During the first nine months of 2013, imports from Ukraine were 31,100 cu.m, 4.7% up on the same period in 2012. Meanwhile, EU imports of temperate hardwood veneer fell from the USA by 4.3% to 29,200 cu.m and from Russia by 9.2% to 20,400 cu.m (Chart 10). Temperate hardwood veneer imports have been rising into Germany, Austria and Poland this year, but falling into Italy and Spain.